(NaturalNews) In the aftermath of the explosive revelation that vegan rice protein products contain significant concentrations of the heavy metals lead, cadmium and tungsten, the natural products industry has been scrambling to produce cleaner plant-based proteins that are substantially free of those metals. I am the person who spearheaded the industry-wide voluntary agreement for meeting stringent heavy metals limits, so I'm in touch with virtually all the top manufacturers and producers of vegan proteins. In the rice protein market, for example, manufacturers are now demanding cleaner batches from importers and putting intense pressure on growers to produce cleaner products out of China, Korea, Indonesia and other nations where rice is produced. There was an initial attempt by a few smaller players in the natural products industry to try to spin the heavy metals issue and convince customers that eating lead, cadmium, mercury and tungsten didn't matter because a part per million is "really small," but the effort flopped. It turns out that virtually all health-conscious consumers are aware of the dangers of heavy metals and seek to avoid them at all costs. Natural News has spearheaded the effort to conduct product testing and share results with consumers. There is no other organization in the world pursuing this important work and publishing the results for free. What's happening now is a rush toward quality materials with low heavy metals. This is also taking place largely because of the willingness of Natural News to publicly pushing my laboratory findings. The entire natural products industry is now fully aware that I am buying products off the shelf, testing them via ICP-MS using EPA-approved methodology variations, and publicly releasing the results. This means they can't hide heavy metals in their products any longer, and all products with high heavy metals will sooner or later be revealed. The transparency we are bringing to the industry is strongly motivating companies to clean up their own raw materials. They are now realizing the heavy metals content of their products will not remain a secret. And the cleaner they can get, the more successful they will be with long-term sales and credibility. Consumers, it turns out, don't want to eat toxic heavy metals! As I've explained here on Natural News, nearly all the rice protein I've ever tested shows signs of significant industrial contamination with heavy metals like lead, cadmium and tungsten. This has everything to do with the soils, air and water in which rice is grown, and how those agricultural inputs are themselves contaminated with industrial pollution. At the same time, we've also found products which are remarkably clean and virtually free of heavy metals. For example, we tested One World Whey protein and found all of its flavors to contain extremely low levels of heavy metals. We've also consistently found that hemp protein -- made from hemp seeds -- is routinely very low in heavy metals, approaching "zero" in most cases. I've also been told that a number of new protein formulations are being put together using Sacha Inchi seed protein from the Amazon rainforest. Sacha Inchi also consistently tests very low in heavy metals. And now, the Sprout Living company has introduced an amazing new seed-based protein product that's also remarkably low in metals: Pumpkin Seed Protein. 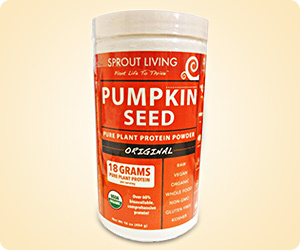 Because of our intense focus on clean superfoods, we're helping Sprout Living launch Pumpkin Seed Protein Powder. Pumpkin Seed Protein Powder is available here. Yes, the lead in this Pumpkin Seed Protein is literally 45 times lower than what we found in some rice protein products. At just 11 ppb, it's approaching zero. This level is usually considered insignificant by most food scientists. This means this Pumpkin Seed Protein is rated A+++ on the new Low Heavy Metals Verified rating system. That's the highest rating possible! Very few products achieve this high a rating. Compare these levels to what we have documented in rice protein, and you'll see that Pumpkin Seed Protein is significantly cleaner when it comes to heavy metals. Until the rice protein industry cleans up its raw materials -- an effort which is under way but will take some time to accomplish -- I'm recommending everyone consume low-metals proteins from other sources. For those who don't mind dairy, whey protein from One World Whey is super clean, with virtually zero levels of all the heavy metals of concern. Personally, I consume One World Whey routinely, and now I'm adding a lot of Pumpkin Seed Protein to add more vegan proteins to my smoothies. My message to you: KNOW what you are eating! Whatever proteins you choose, may primary message to you is to know what you are eating! Whether you choose rice protein, pea protein, hemp protein, whey protein, pumpkin seed protein or something else entirely, make sure it's not contaminated with heavy metals. Keep in mind that an "organic" designation on a product is completely worthless when it comes to heavy metals. All the highest concentrations of lead, tungsten, mercury, cadmium, etc, were all found in "USDA certified organic" products. Currently, the best way to learn about the heavy metals content of the food, superfoods or supplements you are consuming is to subscribe to my email newsletter (below). As we release laboratory results, you get emailed the stories where those results are announced. You can also ask the manufacturer whether they test their products for heavy metals, but I have found that manufacturers sometimes LIE to their own customers about heavy metals, and they almost never test each production lot. 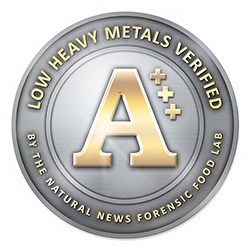 Right now we are testing many other off-the-shelf foods and products for heavy metals, and results will be released regularly at Labs.NaturalNews.com.